Children should be seen and and heard, ideally outdoors. So believes landscape architect and activist Robin Moore, founder of the Natural Learning Initiative. 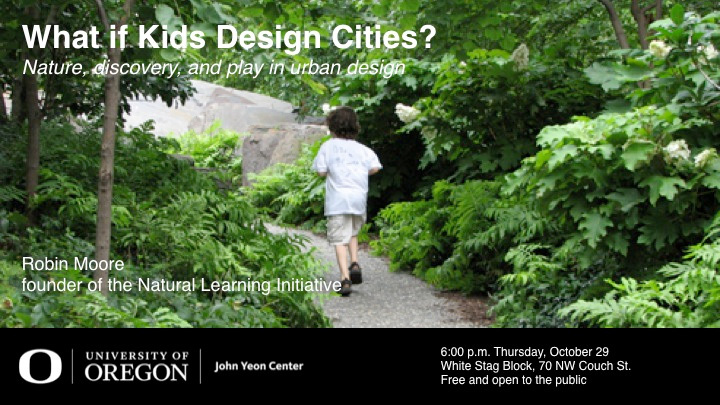 In a lecture and conversation presented by the John Yeon Center for Architecture and the Landscape, Moore will discuss the role naturalized urban spaces can play in child development and what he describes as “landscape architecture’s new quest” to integrate nature for kids in cities throughout the U.S. and the world. Thursday, October 29, 2015, 6:00 p.m.
Robin Moore holds degrees in architecture from London University and urban planning from MIT and is an international authority on the design of children’s play and learning environments. His own designs include the well-known Environmental Yard, in Berkeley, California, and as a consultant he has helped shape such wide-ranging spaces as the Nature PlayScape at the Cincinnati Nature Center to the Playport in the Raleigh-Durham Airport. Currently, he is at work on the Chicago Zoological Society for the programming and design of Explore!, the new children’s facility at Brookfield Zoo, Illinois; and for the City of Durham for the programming and design of renovations to Duke Park as well as the development of the Durham Parks and Recreation Master Plan. Moore is director of the NC State University Natural Learning Initiative and a member of the eight-country Growing Up in Cities action research project sponsored by UNESCO. The Westmoreland Nature Play park was featured in a September 2015 article in the Portland Family Magazine. The article was written by Ariel Frager, a school counselor. Kudos to Sandra and Portland Parks and Recreation for creating, “the most awesome, incredible park in Portland”. “Welcome to Nature”, written by Sandra Burtzos, RLA, of Portland Parks and Recreation and Ben Johnson, PLA, CPSI, of GreenWorks, P.C., was published in the National Recreation and Park Association’s June 2015 publication. Nice job you two! Time: 8:00 a.m. to 2:30 p.m.
Nadaka Nature Park will host a grand opening on Saturday, April 4, to celebrate completion of the park and community garden as well as the unusual and uplifting partnerships that brought down the barbed wire around an urban forest and reclaimed it – and improved it – for the public. The community is invited to celebrate from 10 a.m. to noon at Nadaka, a City of Gresham park located at Northeast 175th Avenue and Northeast Glisan Street in the City’s Wilkes East neighborhood. The new nature-based play area and community garden will be open for the first time, tempting kids of all ages to climb, ride, build and jump on boulders, totem poles, a log cabin and a life-sized canoe carved from local cedar. A sand pit, 50-plot community garden and covered picnic area are also part of the park renovation, which was designed by MIG, a Portland design and planning firm. The celebration is public – because the park is. About 75 percent of the funds used to create Nadaka came from bond measures to support parks that were passed by voters in Gresham and across the region in 1990, 1995 and 2006. Click on the following links to get more information and view photos of the nature-based play area.